Bisected by the Vltava River, "the City of a Hundred Spires" is known for its Old Town Square, colorful baroque buildings, Gothic churches and its medieval Astronomical Clock, which gives an animated hourly show. Besides the stunning architecture, there are also enough local libations and delightful dishes to appease any traveler. Thankfully, there are plenty of relatively inexpensive flights between Harrisburg and Prague. We pulled from travel site Skyscanner to provide you with a short list of flights and hotels handpicked with the trendy adventurer in mind. The cheapest flights between Harrisburg and Prague are if you leave on April 6 and return from the Czech Republic on April 14. United currently has tickets for $903, roundtrip. There are also deals to be had in February. If you fly out of Harrisburg on Feb. 25 and return from Prague on March 3, Iberia can get you there and back for $1,595 roundtrip. To plan your stay, here are some of Prague's top-rated hotels, according to Skyscanner, that we selected based on price, proximity to things to do and customer satisfaction. For an all-around top recommendation, consider The Mosaic House. The hotel has a 4.9-star rating on Skyscanner, and rooms are currently available for $52. There's also the 4.8-star rated The Sophie's Hostel. Rooms are currently set at $16/night. Don't miss Prague's food scene, with plenty of popular spots to get your fill of local cuisine. Here are a few of the top-rated eateries from Skyscanner's listings. If you're looking for a local favorite, head to Marina, which has an average of 4.6 stars out of five reviews on Skyscanner. "Excellent restaurant on a boat in Prague," wrote visitor Barbara. "You can get everything there. From Mediterranean to Czech food. I had the buffalo mozzarella and the beef cheeks on beetroot puree. Simply delicious!" Another popular dining destination is Cacao, with five stars from 14 reviews. "Great cafe in the central part of Prague with spectacular views ... The environment is very cozy and staff is friendly," wrote reviewer Josef. Also worth considering is Villa Richter. "Set among vineyards on the hill beneath Prague Castle, the atmosphere at this renovated villa is really magical," wrote Clare. "It's divided into three parts: the Italian restaurant Terra; the casual, outdoor summer terrace, serving wines grown right here in the castle vineyard; and the traditional Czech restaurant Piano Nobile." 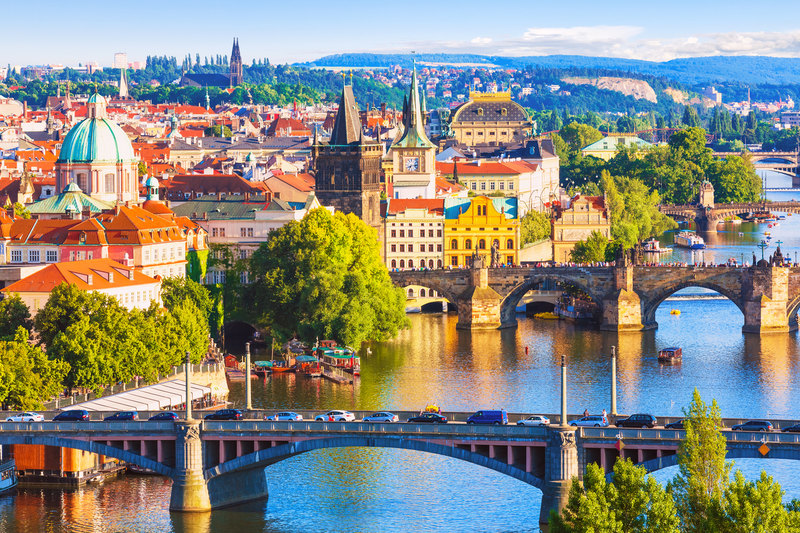 To round out your trip, Prague offers plenty of popular attractions worth visiting. Here are some top recommendations, based on Skyscanner's descriptions and reviews. Joining the Lesser Side with Old Town, the Charles bridge is famously the best spot for viewing the Prague Castle. Thousands of people traverse this cobbled bridge every year. Find street performers, vendors and a pleasant view of the city from this iconic eastern European landmark.